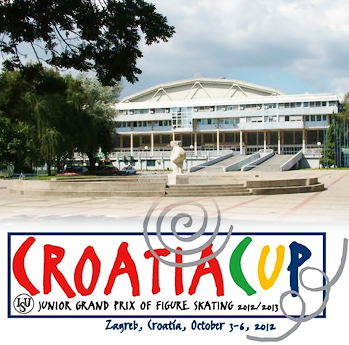 The 2012-13 ISU Junior Grand Prix of Figure Skating continued this week in Zagreb, Croatia, with approximately 128 skaters/teams representing 45 countries competing in the Men, Ladies, Pairs, and Ice Dance disciplines. The athletes competed to earn points towards qualification for the ISU Junior Grand Prix (JGP) of Figure Skating Final which will be held in Sochi, Russia in December. Margaret Purdy and Michael Marinaro of Canada rebounded from fourth place to their second consecutive JGP title, while China’s Xiaoyu Yu and Yang Jin moved up one spot to capture the silver. Russia’s Vasilisa Davankova and Andrei Deputat slipped one spot to third to settle for bronze. The top five teams, all of which gave good performances with no major errors, were separated from each other by just less than a point. They all landed side by side double Axels and throw triple Salchows, and showed good footwork and spins. Evgenia Tarasova and Vadimir Morozov of Russia had a tight landing on their throw triple Salchow, but otherwise earned a level four on all other elements except for a level three death spiral. The new team, who displayed good unison, also impressed the judges with their double twist which earned many positive grades of execution (GOE). They scored 51.89 (28.86/23.03) points for a first place finish for their smooth routine in their JGP debut. Teammates Davankova and Deputat finished second with 50.42 (27.44/22.98) points after their routine to music from The Godfather soundtrack. The reigning Russian Junior champions earned positive GOEs for their triple Salchow, and also earned a level four on their lift and spin. Their double Axels were particularly good, and their footwork was graded a level three. Yu and Jin wowed the judges with their huge throw triple Salchow and level four double twist which earned many positive GOEs. The World Junior silver medalists also earned a level four on their spin and lift in their routine to Mendelssohn’s Violin Concerto in E minor, Op. 64. Their footwork was only a level two, however, and they placed third with 50.18 (28.26/21.92) points. Purdy and Marinaro also earned positive GOEs for their throw triple Salchow, as well as their level three straight line footwork on their hypnotic routine to Puccini’s O Mio Babbino Caro. The 2012 JGP Lake Placid champions, who also earned a level four on their combination spin, finished fourth with 49.23 (26.26/22.97) points. Russia’s Kamilla Gainetdinova and Ivan Bich rounded out the top five with 49.10 (27.00/22.10) points. The Russian Junior bronze medalists earned the most GOEs for their throw triple Salchow of all 14 teams. Purdy and Marinaro had a slightly flawed catch on their opening triple twist, and Marinaro had a tight landing with a hand down on the first jump of the side by side triple toe-double toes in their sentimental routine to music from The Artist soundtrack. The team from Ontario also lost points when Purdy two-footed and stepped out of the landing of the throw triple Salchow, however, their throw triple loop was solid. The Canadian Junior champions also executed good quality double Axels and showed good spins and lifts as well, placing first in the long with 98.17 (49.36/48.81) points. With a total score of 147.40, they rose from fourth to first overall. After two JGP wins, the team has qualified for the JGP Final which will be held in Sochi, Russia in December. Yu and Jin placed second in the long with their charming routine to Strauss’ Die Fledermaus, earning 95.82 (49.99/45.83) points. Yu two-footed the landing on the triple toes, and had problems on the second jump of the double Axel-double Axel sequence as well. Nevertheless, the current Chinese bronze medalists executed a huge throw triple Salchow, throw triple loop, and triple twist—all of which earned many positive GOEs across the panel. The 2012 Youth Olympic Games junior champions also displayed two level four lifts, a level four death spiral, and good spins. With a total score of 146.00 points, they rose from third to second overall. Davankova and Deputat lost points due to low levels on several elements in their labored routine to music from the Once Upon a Time in Mexico soundtrack. The World Junior bronze medalists earned a level one on their triple twist and their final combination spin which had a flawed entry. They also only received a basic level for their death spiral. Davankova also underrotated and two-footed the landing of the first jump of their triple toe-double toes. Despite the mistakes, the JGP Lake Placid silver medalists produced a solid throw triple loop, and earned a level four on two of their lifts and a Flying Camel combination spin. They placed third in the long with 93.20 (46.49/46.71) points, and slipped to third overall with 143.62 points. Gainetdinova and Bich placed a close fourth with 93.16 (49.32/43.84) points. The current Russian Junior bronze medalists opened with side by side triple Lutz-double toes—the first time in history this element has been executed in a junior competition by a pairs team. They also landed a throw triple loop and throw triple Salchow, however, the team struggled with their spiral sequence and side by side double toes. The placed fourth overall with 142.26 points. Tarasova and Morozov, who stood in first after the short, had difficulty with their jump elements to finish fifth in the long (85.40) and overall (137.29). Maxim Kovtun of Russia edged out China’s Han Yan for the gold, while USA’s Harrison Choate captured the bronze. Yan opened his exuberant routine to Jalousie with a very good triple Axel which earned +2 positive Grades of Execution (GOE) from all nine judges. The reigning World Junior champion also landed a solid triple Lutz-triple toe and displayed good level four straight line footwork, but lost points due to an edge call on his triple flip, which also had a bit of a hard landing. He also earned no points for his final spin (the required change foot sit spin) as the thigh of his skating leg was not at least parallel to the ice in the second half of the spin. He finished first in the short with 70.47 (38.73/31.74) points. Kovtun placed a close second with 69.47 (38.90/30.57) points. The 17-year-old also landed a high quality triple Axel and good triple Lutz-triple toe, but suffered an edge call for his triple flip which had a wide-swinging free leg on the landing. He earned positive GOEs for his spins and footwork for his program to heavily percussive selections from the Lawrence of Arabia soundtrack. Choate stepped out of the landing of the second jump on his opening triple Lutz-triple toe, but recovered to land a sold triple flip and double Axel in his skate to the Latin rhythms of Perez Prado. The 17-year-old from Weston, Mass., also earned a level four and positive GOEs for all his spins and straight line footwork—the highlight of his routine, placing third with 64.05 (34.26/29.79) points. Teammate Nathan Chen underrotated and fell on his opening triple Axel, and later underrotated the second jump in a triple Lutz-triple toe in his uplifting routine to Kreisler’s Praeludium and Allegro. The current US Junior champion also earned no points for his change of foot sit spin as he did not achieve a full sit position in either half of the spin. He finished fourth with 55.85 (27.50/29.35) points. Chih-I Tsao of Chinese Taipei placed fifth (53.94), followed by Canada’s Mitchell Gordon (53.92). Kovtun had a nearly perfect program in his skate to music from Casablanca, opening with a quadruple toe-double toe, followed by a triple Axel-triple toe. The current Russian Junior bronze medalist also landed a second triple Axel in addition to four more triples, and his only error was an edge call on a triple flip. Five of his jumps earned bonus points for being executed after the two minute mark in the program. The teen from Ekaterinburg, who portrayed his character well, also earned many positive grades of execution for his footwork and spins, and placed first in the long with 149.72 (80.00/69.72) points. With a total score of 219.19 points, he moved up one spot to first overall to win his second JGP gold medal. Yan danced his way through his routine to Masquerade Waltz, opening with a flowing triple Axel and triple Lutz-triple toe. He received an edge call on two triple flips, but otherwise landed three more clean triple jumps. The 2011-12 JGP Final silver medalist earned a level four on only one of his spins and a level two for his footwork, placing second with 141.63 (71.57/70.06) points. With a total score of 212.10 points, the 16-year-old slipped to second overall. South Korea’s Jin Seo Kim, who stood in eighth after the short, placed third in the long with 125.06 (68.34/56.72) points for his engaging routine to music from Cirque du Soleil. The 2012 JGP Austria bronze medalist also received an edge call on a triple flip, but otherwise landed a total of eight triple jumps – including two triple Axels. The 15-year-old finished fourth overall with 176.43 points. Choate landed a total of six triple jumps in his routine to music from the Slaughter on 10th Avenue soundtrack. Despite the lack of a triple Axel, the US Junior pewter medalist impressed with level four spins and footwork, and placed fourth in the long with 121.34 (60.28/61.06). With a total score of 185.39, he was able to maintain third overall to win the bronze. Andrei Zuber of Russia catapulted from 15th to fifth place overall (162.88) after placing fifth in the long (116.36). Michael Christian Martinez of the Philippines finished sixth (162.40), followed by Petr Coufal of the Czech Republic (160.30). Chen, who stood in fourth after the short, withdrew from the competition due to an injury of his lower leg. Russia dominated the ice dance podium with Valeria Zenkova/Valerie Sinitsin and Evgenia Kosigina/Nikolai Moroshkin taking the gold and silver, respectively, while USA’s Rachel Parsons and Michael Parsons won the bronze. All three teams were separated by just a few tenths of a point. Kosigina and Moroshkin won the short dance with 56.70 (29.22/27.48) points for their fast-paced routine to Ronan Hardiman’s Capone. The JGP Lake Placid silver medalist showed high speed throughout their routine, however, their Blues pattern dance scores dropped due to the fact that they only received credit for two of the six key points, and their synchronization on their twizzles was not perfect. The team otherwise produced an excellent level four curve lift and level three midline steps. Parsons and Parsons surprised with a second place finish of 56.35 (31.93/24.42) points, improving their personal best by over five points since the JGP Austria event three weeks ago. The 2012 US Junior pewter medalists, who displayed entertaining hip-hop moves in their routine, earned the highest technical score of the event and hit five out of six key points. Their smoothly skated blues pattern dance was the highlight of their routine, and they also earned a level three for their midline step sequence. Like their teammates, Zenkova and Sinitsin also struggled a bit with the Blues pattern dance, experiencing trouble maintaining a match of leg line in the swing rolls and Choctaws, and hitting only three of the six key points. The current Russian Junior bronze medalists otherwise earned a level three on their midline steps and a level four on a very fast rotational lift which earned many positive GOEs. They finished third with 54.42 (28.50/25.92) points. Canadians Mackenzie Bent and Garrett MacKeen also hit only three of six key points in the pattern dance; however, their curve lift and twizzles garnered a level four. They placed fourth with 51.97 (27.72/24.25) points. Alexandra Nazarova and Maxim Nikitin of the Ukraine placed fifth (49.13), followed by Canadians Melinda Meng and Andrew Meng of Canada (46.85). Zenkova and Sinitsin put out a smooth and polished routine to Cats, placing first in the free dance with 80.21 (39.25/40.96) points. The team from Moscow displayed good level four lifts and had a nice entry into their level four twizzles. Their circular and diagonal steps were graded a level three and two, respectively, and they also earned many positive GOEs for their opening level four dance spin. With a total score of 134.63, they edged out their teammates to win the title. After earning 15 points for their win at this event, the 2012 JGP Courchevel silver medalists have now qualified for the JGP Final. Kosigina and Moroshkin performed an energetic routine to a Michael Jackson medley which featured level four lifts and twizzles, however, their diagonal and circular steps were only graded a level two and one, respectively. The former Russian Junior bronze medalists placed second in the free dance with 77.89 (36.20/41.69) points, and slipped to second overall with 134.59 points. The team, who placed second in Lake Placid as well, have also earned a spot at the JGP Final in December. Parsons and Parsons showed quick and clever feet in their routine to Walpurgis Night Faust and Three Nymphs by Charles Gounod. The team from Rockville, Md., earned a level three for their diagonal and circular steps, and a level four for their twizzles. The team earned a level four for all their lifts, and placed a close third with 77.74 (39.96/37.78) points. Although the team had the highest total element score (TES) of the event, with a total score of 134.09, they slipped one spot to third overall. Bent and MacKeen failed to medal as they received very low levels from the technical panel for their step sequences and one of their lifts in the free dance. The JGP Austria bronze medalists finished fourth overall (118.64). Nazarova and Nikitin placed fifth overall (114.06), followed by Meng and Meng (113.02). USA’s Angela Wang and Hannah Miller took the gold and silver, respectively, while Anna Pogorilaya of Russia earned the bronze in her JGP debut. Wang opened her short program with a huge triple Lutz-triple toe which had an excellent run out, followed by a very good triple flip in her exciting routine to music from the Crouching Tiger, Hidden Dragon soundtrack. The 16-year-old also landed a double Axel from an Ina Bauer position, and earned a level four on all three spins which were well-centered and had good speed. Her martial arts themed footwork sequence had great energy, and she placed first with 58.47 (34.93/23.54) points. Pogorilaya placed second with 51.67 (30.55/21.12) points with her Middle Eastern routine, which was performed with deliberate angular positions and flourishes to accommodate the theme. The 14-year-old opened with a triple toe-triple toe, but received an edge call on her triple flip. She otherwise landed a double Axel and earned a level four on all four spins, the last of which was a particular highlight. Miller struggled with her triple toe-triple toe and received an edge call on her triple flip, but otherwise landed a good double Axel in her peppy routine to Mayor’s Tanjuera. The US Junior bronze medalist also earned a level four on all her spins, and finished a close third with 51.33 (27.88/23.45) points. Canada’s Alaine Chartrand displayed good footwork and spins in her smooth and flowing program to First Date by Edvin Marton, but underrotated the second jump on a triple Lutz-triple toe, and her triple flip was downgraded. Nevertheless, her double Axel, which was executed from a series of difficult turns, was the highlight of her routine, and the 16-year-old placed fourth with 47.62 (26.22/21.40) points. Kristina Zaseeva of Russia placed fifth (47.38), followed by Japan’s Rika Hongo (45.93). Wang won the long program with 104.18 (55.67/48.51) points for her moving routine to music from the Ladies in Lavender soundtrack. The teen from Colorado Springs, Colo., opened with a good triple Lutz-triple toe-double toe, but then singled a flip. However, she landed three more triple jumps, including a very good Lutz, and displayed good spins and footwork. She maintained first overall with a total score of 162.65 points. Miller displayed exceptionally intricate level four footwork in her routine to Havasi’s The Storm. The JGP Austria silver medalist turned out of her first jump on a triple flip-double loop-double loop combo, and later underrotated a triple flip (in sequence with a double Axel). She also slightly two-footed the landing of a triple loop, but otherwise landed a total of four clean triple jumps, placing second in the long with 101.88 (54.5/ 47.32) and overall (153.21). Zaseeva placed third in the long with 96.23 51.60 44.63 points for her routine to music from The Umbrellas of Cherbourg soundtrack. The 16-year-old doubled a triple loop, but otherwise landed four clean triples and earned a level four on all three spins. With a total score of 143.61 points, the student from Moscow moved up to fourth overall. Hongo, who stood in sixth after the short, placed a close fourth in the long with 95.04 (53.00/43.04) points. The 2012 JGP Courchevel silver medalist fell on a triple loop and underrotated a triple Salchow, but displayed good footwork and spins in her routine to Swan Lake. She finished fifth overall with 140.97 points. Pogorilaya, who stood in second after the short, fell on a triple loop and popped a Lutz, placing fifth (93.87). However, with 145.54 points overall, the Russian was able to hang onto third place overall in her JGP debut. Chartrand placed sixth overall (137.72), followed by Josefine Taljegard of Sweden (121.51).